Meet the Hybrids explores the lived experience of eight individuals who understand that they are part-human and part-extraterrestrial. Guided by their star families and other entities, they are dedicated to personal missions which contribute to a larger process involving the flourishing of human consciousness, and the protection and evolution of life on Earth at this critical time. Based on over 100 hours of interviews and conversations, this book gives each of the hybrids their own voice. They share their personal journeys of discovery, their abilities, and the joys and challenges of living a dual existence. They invite the reader to radically expand their understanding of reality itself, and pursue their own evolution. The hybrid phenomenon brings us closer than ever before to understanding the ETs themselves, and offers answers to some of humanity's biggest questions. "As an investigative journalist studying complex evidence of an ET presence on Earth, it has emerged that hybrids with human and ET DNA are emerging in increasing numbers. But why? Insights to that question from people who identify as hybrids are the core of this important book. Miguel Mendonca and Barbara Lamb have courageously focused on one of this planet's forbidden subjects." - Linda Moulton Howe, Reporter and Editor for Earthfiles.com, and Investigative Reporter for Coast to Coast AM "Meet the Hybrids is a cutting edge dialogue which offers an in-depth perspective from individuals who connect to a hybrid state of being. As a therapist and researcher this information is an extremely valuable resource. 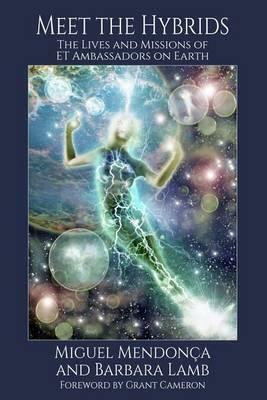 For those who identify as hybrids it will be both validating and healing-confirming that they are not alone. A landmark book." - Mary Rodwell, Principal of ACERN, author of Awakening. Miguel Mendonca is an Anglo-Azorean writer of fiction and non-fiction, in which he explores truth, relationships, consciousness and ufology. He is the author of five books. Barbara Lamb is a licensed psychotherapist, hypnotherapist and regression therapist in Southern California. She has worked with over 1,700 people in relation to extraterrestrial encounters. She has co-authored two books, Alien Experiences and Crop Circles Revealed.